The team at Banff Airporter Inc.® prides itself on high-quality transportation not often associated with airport runs. The company’s scheduled service on the 90 miles between Calgary International Airport and Banff, a resort town in Alberta, Canada, has run for more than 20 years. Mark Yawney, general manager of Banff Airporter, said the company tries to exceed passenger expectations about airport shuttles. Yawney said that he was first cognizant in 2017 of the pressure this influx of new vehicles placed on his employees. Banff Airporter’s high standards for vehicle cleanliness and presentation translated to significant labor by the team assigned to bus and automotive detailing. Yawney said he initially wanted to revolutionize Banff Airporter’s bus washing out of a desire to make work more enjoyable for his employees. He said he first discovered gantry, or rollover, bus wash systems while searching the internet for single-brush, “walkaround” power washers. 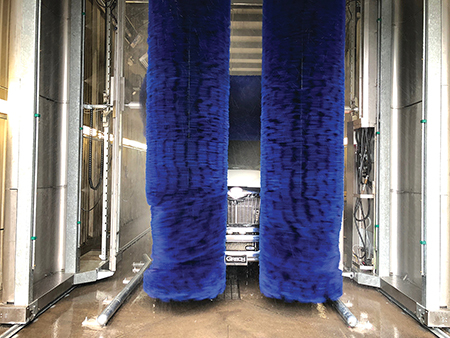 An automated gantry system is functionally similar to an automated car wash – except the driver does not need to sit in the bus during washing — and requires significantly less labor from employees tending it. Yawney began calling companies he had researched but received mixed reactions. Most were interested in talking to him, he said, but seemed to think Banff Airporter was not entirely serious about the required investment. The systems he was researching seemed better suited for a municipality or multi-regional business. The Banff Airporter team narrowed the search to a few suppliers with distribution chains in Alberta, receiving three quotes before ultimately settling on InterClean Equipment, an Oakland Industries company, and its exclusive West-Canadian distributor NoviClean Inc.
InterClean Equipment, LLC, established its manufacturing in 1984. Based in Ypsilanti, Michigan, InterClean has more than thirty years of history designing, manufacturing, and commissioning heavy duty bus, truck and train washing systems for transit, municipal, and commercial fleet markets, as well as other, more specialized products for markets such as mining, and military/defense. As an InterClean-exclusive dealer and service network, NoviClean is one of the most experienced members in InterClean’s global distribution infrastructure. 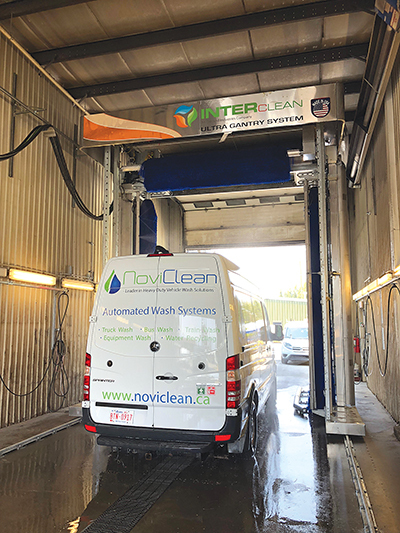 The amount of NoviClean employees in Alberta and able to directly service the Banff Airporter headquarters had a significant impact on Yawney’s decision to go with an InterClean gantry wash system. The system InterClean and NoviClean delivered to Banff Airporter is the Ultra automated gantry wash, which was configured as a three-brush machine. The Ultra is highly configurable and able to be supplied with friction (brush) cleaning, as in the Banff Airporter case, or completely touchless cleaning. This spectrum of cleaning options allows the machine to be configured for a wide variety of vehicle types and fleet sizes. In addition to the various wash actions available, the machine can be coupled with InterClean’s water recycling and treatment technology to minimize environmental impact and maximize the sustainability of a customer’s wash site. Banff Airporter is using a three-brush Ultra model, with two vertical brushes and one horizontal brush. It has a two-step (high and low pH) chemical application followed by a final rinse. 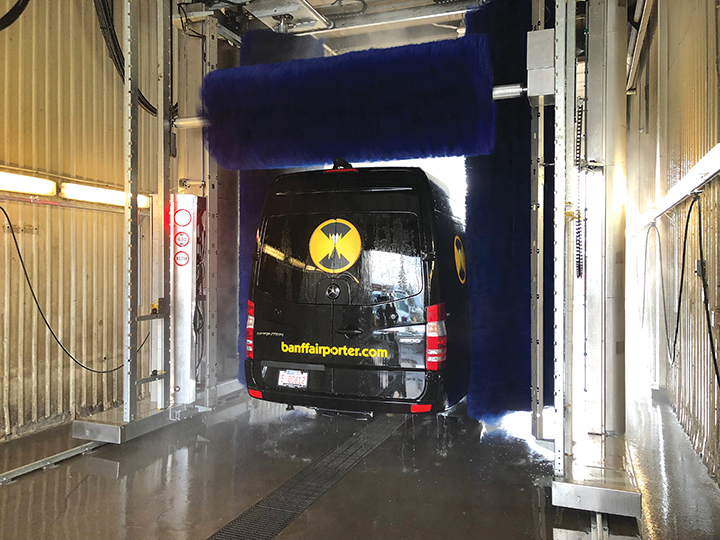 This relatively simple configuration was ideal for Banff Airporter in that it minimized system complexity but allowed for the flexibility to wash Banff Airporter’s entire range of vehicle types. Yawney said the installation by NoviClean took approximately 10 days to complete. 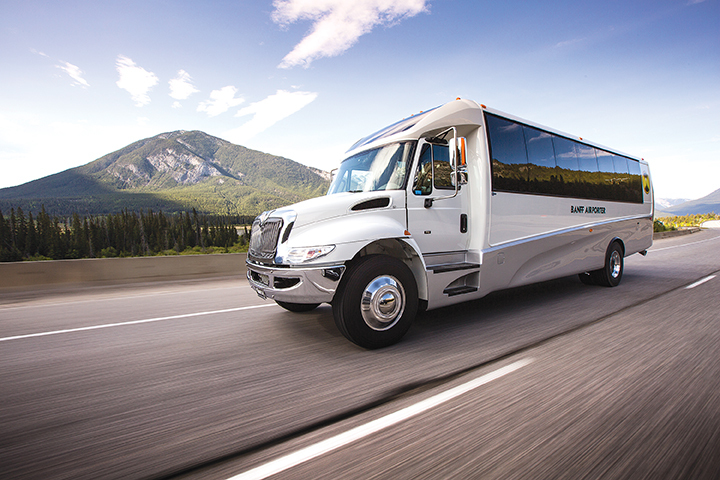 Working with InterClean’s in-house team of application and design engineers, NoviClean programmed the system for Banff Airporter’s five vehicle types (with two wash settings per vehicle), allowing for detailers to automatically wash any bus in the fleet with the press of a few buttons. Yawney said that most of the reviews for his company on Trip Advisor mention the cleanliness of his vehicles, a source of pride for Banff Airporter. That means that, while InterClean delivered Banff Airporter a purpose-built, basic three-brush machine, the underlying software is agile, modularized and highly customizable for a variety of specifications. The system support by InterClean and NoviClean has been fundamental to the success of the installation at Banff Airporter, Yawney said. The technology in the system allows for NoviClean techs to diagnose and correct issues remotely, and monthly preventative maintenance sessions allow the Banff Airporter staff to learn on the job.